Public Transportation The Harvard Square stop on the Red Line of the MBTA subway system is across the street from the Harvard Yard. Take the two sets of escalators out of the T stop (this is the Main exit). After exiting, you will need to reverse direction and head up Massachusetts avenue (away from the newsstand and Information Kiosk). Continue walking past Cambridge Savings Bank, crossing Dunster St. (The Harvard gates should be on your left side) After the Au Bon Pain Café, turn to the right and enter the Smith Campus Center. Traveling by Car Driving from South of Boston: Take I-93 North to exit 26 (Cambridge/Storrow Drive) in the recently opened Big Dig tunnel. The exit ramp merges with traffic on Storrow Drive from the left. Move to one of the right lanes and continue on Storrow Drive approximately 4 miles to Cambridge/Allston. After a Doubletree Guest Quarters Hotel, take the right-hand exit to “Harvard Square - Cambridge.” Turn right at end of ramp onto John F. Kennedy Street. 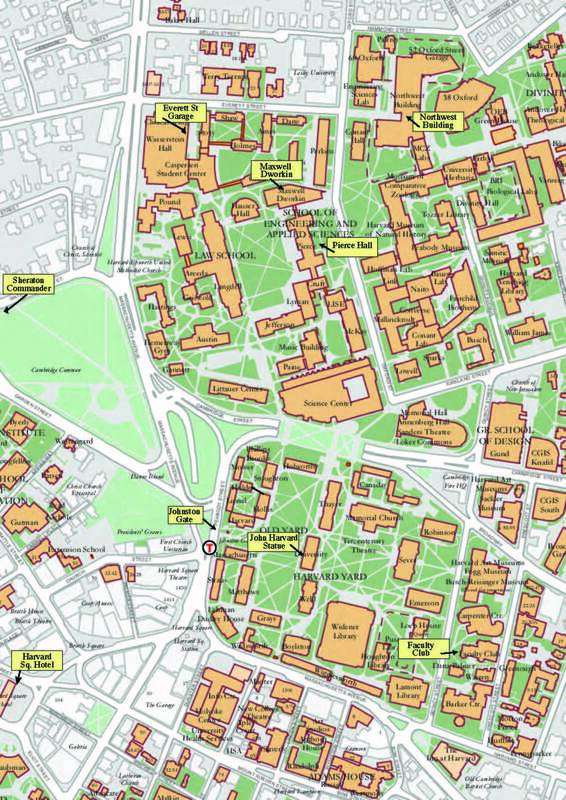 Harvard Square is approximately 1/2 mile straight ahead.